Say "buongiorno" to your new potluck staple. 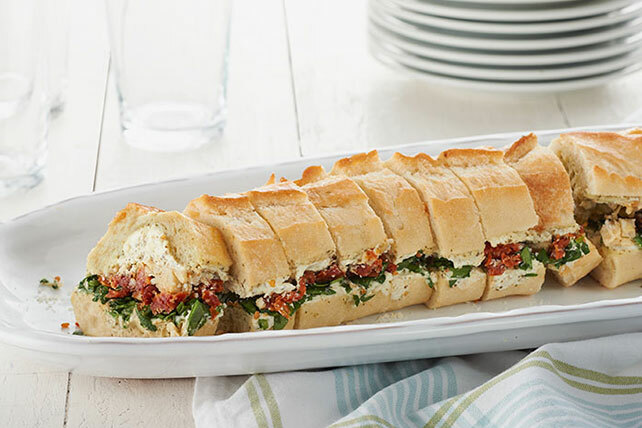 It's packed with savory Italian flavor thanks to sun-dried tomatoes, pesto and Parm. After tasting it, you may say "ciao bella!" Mix cream cheese spread and pesto; spread onto insides of bread shells. Fill with tomatoes, artichokes, Parmesan and spinach. Reassemble baguette; wrap tightly in plastic wrap. Refrigerate 1 hour. Add chopped green or kalamata olives to sandwich filling. Sandwich can be stored in refrigerator up to 4 hours before serving. Substitute arugula leaves for the spinach.